Easter Island--Rapa Nuiis a tiny speck of land in the South Pacific. Formed by a series of massive volcanic eruptions, the island was only inhabited by sea birds and dragonflies for millions of years. Its steep slopes, however, stood out like a beacon to a weary group of Polynesian seafarers. How long their voyage took or their reasons for leaving their home country are questions that we'll never have the answer to, but we can imagine their joy at seeing this sight after what must have been months at sea. Lava tubes and pounding waves have created hundreds of sea caves and a trecherous coastline. There are only a few small areas that are safe for anchorages. Located in the South Pacific between Chile and Tahiti, Easter Island is one of the most isolated inhabited islands in the world. Roughly triangular and covering only 64 square miles, it formed when a plume of hot material rose from deep within Earth's interior, burned through the crust and erupted onto the surface as lava. Today, volcanic cones are found at each point of the island. 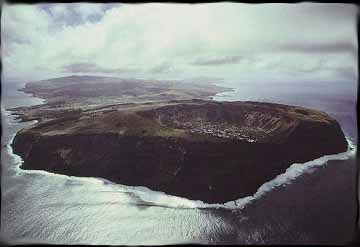 The largest, Rano Kau is easilyvisible from space. The Highest is Terevaka, which rises to 11674 feet above sea level. There are over 70 eruptive centers on the island but none has know activity since the island was colonized 1300 years ago. 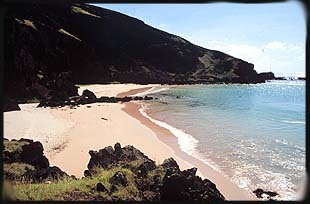 Ovahe Beach, North Shore This sheltered sand beach is close by to Anakena, where the legends say King Hoto Matua landed his double hulled canoe, thus beginning the occupation of Easter Island. Anakena is a beautiful white sand beach stands out from the rest of the coastline, which is either sharp black lava rock or vertical cliff faces hundreds of feet tall. 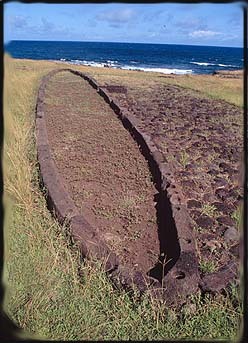 It is at Anakena that the legends say Hotu Matua landed and began the colonization of the island. Excavations of this area have discovered that it was an important site and it boasts one of the best collections of erected Moai on the island, Ahu Naunau. The voyagers started constructing villages and houses made in an unusual elliptical shape. It has been speculated that this style of construction started when the new arrivals turned their boats upside down for quick housing. There were literally hundreds of remains of these foundations on the island in the 1800's, but most were destroyed by the missionaries to make fences. Indeed, the missionaries did more damage to the island's history than even the Peruvian slave traders, which carted off most of the island's population. Those who escaped by hiding in the island's many caves were "saved" by these missionaries, who proceeded to destroy all the islander's wooden sculptures, religious artifacts and most importantly, the Rongo- Rongo tablets, which contained a record of the lost language of the Rapa Nui. So few of these tablets remain that no one has been able to decipher them satisfactorly. The first islanders found a lush island, filled with giant Palms which they used to build boats and housing. The plants they brought with them did well in the rich volcanic soil and by AD 1550 population on the island hit a high of between 7000 and 9000. Distinct clans formed as the population increased and various population centers grew up in different areas of the island. One thing tied them all together, however, the statue construction and the cult that formed around it. All rights reserved. Unauthorized copying and manipulation is prohibited.